When you are looking to update your home with new carpet or hardwood floors, it can be hard to find a reliable flooring retailer that offers both great prices and expert installation services. Carpet World of Alaska Inc. located in Palmer, AK, should be one of the first places you think of when you are in need of a local full-service flooring contractor who has the necessary tools and experience to make your commercial or residential project a success. Since 1983, this locally owned and operated business has been exceeding the expectations of their customers in each and every job. From answering all your questions on the showroom floor to arriving promptly and thoroughly cleaning the work area after every installation, their team is made up of true professionals. No matter what look you are going for in your home, from cozy and warm with plush carpet to industrial with stone and tile, you will be able to create the perfect aesthetic. They offer an extensive selection of flooring products, including laminate flooring, tile, stone, bamboo, hardwood, and carpet. All of their products are from the brand names you know and trust, like Mannington®, Armstrong®, Marmoleum®, and Dansk Bamboo®. 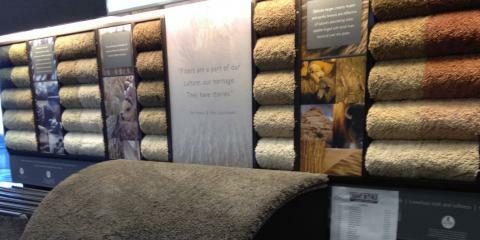 For all of your flooring needs, trust in Carpet World of Alaska, the carpet retailer and home improvement specialist. Call them today at (907) 745-3737 to request an estimate or visit them online to learn more about their available services. You can also like them on Facebook.